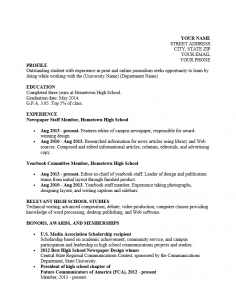 The High School Student Resume for College Template gears itself to be useful to those fresh out of high school who wish to work in a college. This can be a very rewarding career with many benefits and while the competition may be somewhat intense for these positions, a well-constructed resume with impressively written content may serve to even the odds even against those with significantly more experience. A resume is basically an applicant’s paper introduction to a potential employer. It should be concise, to the point, and should aim to be memorable. This document will be received by a recruiter among a staggering number of similar documents and so should also look fantastic. An at-a-glance assessment made upon receipt will often determine which pile it will go in. Obviously, one wants to go into the ‘must contact as soon as possible’ pile. 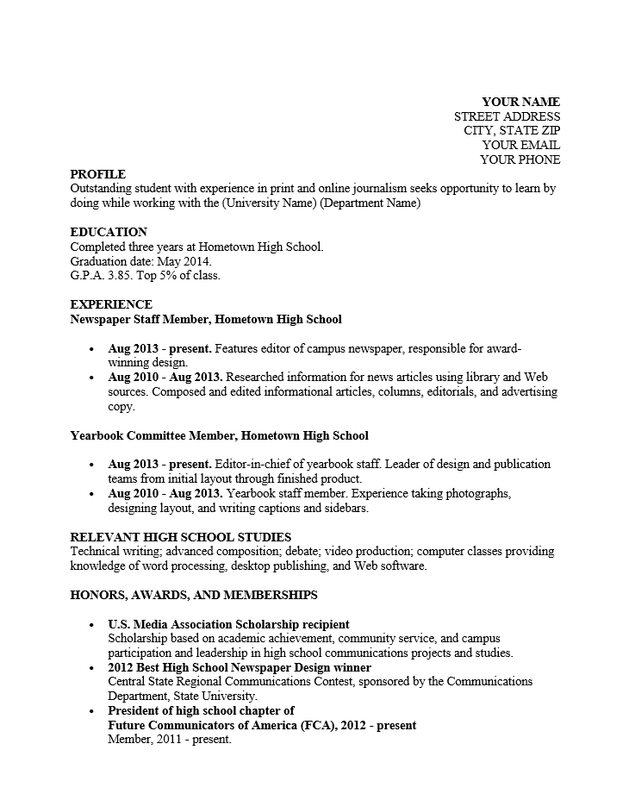 Thus, when writing your resume, choose one of the easy to use standard printer fonts (i.e. Arial, Garamond, Calisto, and Times Roman Numeral) that compliments your name, contact information and content. This document must not only look good but must be easily printable by the recruiter. A template is a document that contains a set format with sections that may be filled in by the user. This means that one need only compose a master copy with all the information one wants which will enable a quick copy and paste for additional copies geared toward a specific purpose. In this case, the purpose is to apply to a college position relatively quickly with a high quality resume thus gaining an interview. This is easily done if job hunters do not need to start from scratch every time they spot an opportunity they wish to apply for. (Note: While it is a good idea to apply to many universities at once, it is not necessarily a good idea to apply to many departments in the same university). The High School Student Resume for College Template will serve as both a resume and a template which adds a level of organization to a job hunt but the content must be well thought out. When combining high quality content with the High School Student Resume for College Template, job hunters are able to level the playing field somewhat when seeking an interview for a sought after position. Step 2. Write one to three sentences describing yourself in a professional setting. Keep this somewhat general and complimentary. Place this under the heading labeled “Profile” (hint: look up current resume buzzwords and incorporate them here and throughout your resume). Step 3. The Education section is a straight forward reporting on the results of your academic career thus far. 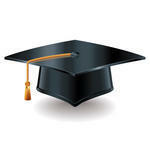 Include the name and location of your school, the date of graduation (or expected date), and degree/diploma/certificate. This is also where GED information would go. If there are any relevant or particularly impressive tidbits include this below. Step 4. Though you may not have worked in an office, odds are you have done something for your school, volunteered somewhere, or perhaps taken the odd job here and there. This should go in the “Experience” section. The first line should always include what your title was and where you worked. If you have only general duties performed over a span of time include a date range on this line and follow with a general description. If you can break down your duties by date do so and place that information along with a description of what you did below the first line of the entry. Step 5. If you have any particularly relevant studies to report, place this in the Relevant High School Studies section. If not, delete the heading. Step 6. List any applicable and/or impressive notoriety, extracurricular organizations/activities, and accomplishments outside of coursework in the Honors, Awards, and Memberships section.